Discussion in 'Roller Coaster Construction' started by CrashCoaster, Dec 31, 2017. Kw6sTheater, Snoo, CoasterEv and 1 other person like this. I see the whole estate being completed first. New builds are like pop up tents now. They'll open this coaster on new year's eve I'll bet. We got news. This is from XYZCoaster's discord, believe it or not. Kw6sTheater, Pear, bernatc22 and 3 others like this. They look a lot like Mack Rides supports. Do Premier and Mack get their supports from the same firm? Because I know neither company manufactures them themselves. WCR is being manufactured by OCEM (Gerstlauer's manufacturer and manufacturer of Gale Force and Tigris), whereas Mack do their own manufacturing in house. Typically Premier uses Intermountain Lift in Utah, but they're currently busy with Steel Curtain since S&S use them as well. CrashCoaster and PetskuC like this. No footers, but some supports on site? This is such a joke. bernatc22, Zek_Teh_Kek and b&mfanboy123 like this. I think premier has Valley iron produce the supports and Intermountain does the track. Jackson and EthanCoaster like this. It's been raining like crazy for the last few weeks, a relative rarity in SoCal. I'm sure that's put them even further behind schedule, although even I can't fault them for that particular delay. They just broke ground today and began digging and pouring footers. bernatc22 and Matt N like this. Matt N, CrashCoaster, Peet and 2 others like this. How long until they change the "pit stop" to a second station to call it two creds. bernatc22 and Snoo like this. When's the estimate for the current opening timeline now? 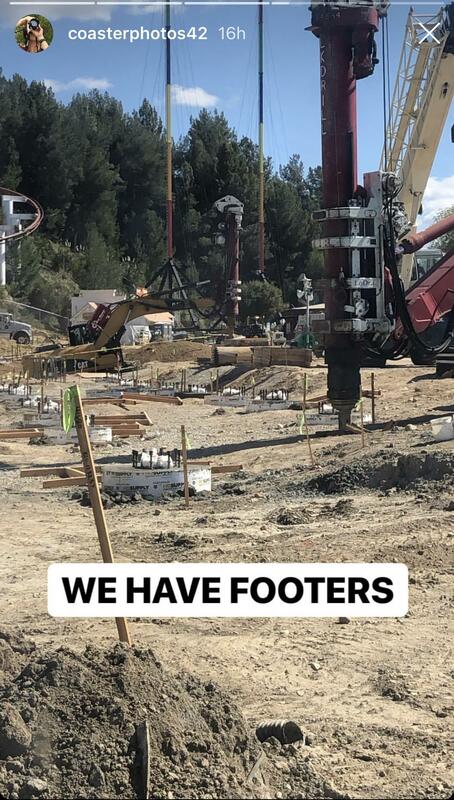 I was told originally June/July, but judging by the very delayed construction I seriously doubt Six Flags can pull off an opening that soon - if only footer placement began last month. Even with other Premier coasters like the Skyrocket IIs, footers took about a few months to do and then the track went up in rapid-fire sequence. I do hope that Premier Rides can pull off a speedy installation with this one (obviously checking the track quality while they work) and make up for the construction delays - that would be quite the miracle! I'd be amazed if this opens before September. Even September seems iffy imo. bernatc22, EthanCoaster and rideguy70 like this.